Fish pie is a very simple and flexible dish, but the combination of fish in a creamy white sauce topped with smooth mashed potato is totally comforting. First of all, peel and coarsely chop the onion and add it to the milk in a jug to infuse for 30 minutes. If you are using saffron, add that too. Peel the potatoes and cut into evenly-sized chunks. Bring a pan of salted water to the boil and simmer for 10-15 minutes until tender. Drain the potatoes, add a big knob of butter, a splash of milk, a pinch of salt and half a teaspoon of white pepper. Mash until smooth and set aside. Strain the milk into a large frying pan, retrieve the saffron and add that. Place your fish fillets in a single layer in the pan. Poach the fish on medium heat for 5-10 minutes until the flesh has turned opaque and flakes easily. Remove the pan from the heat, and put the fish on a plate. Melt a knob of butter on medium heat and stir in the flour until it is evenly mixed. Stir in the poaching liquid, parsley and capers. When the sauce has thickened (about 5 minutes), break the fish into flakes and stir it in. Remove the sauce from the heat. Preheat your oven to 200°C (392°F). Spread out the sauce in the bottom of an ovenproof dish. Carefully spread the mashed potato in an even layer over it. Make patterns in the potato with the tines of a fork (these ridges will catch the heat and turn a bit brown and crispy), and then sprinkle finely grated parmesan across the top. Put the pie in the oven and bake for about 30 minutes. The video above is from the Keef Cooks YouTube channel. 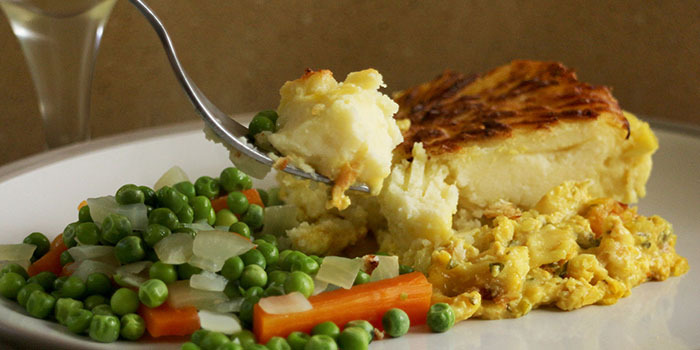 Click here to see the video recipe of Fish Pie on YouTube.